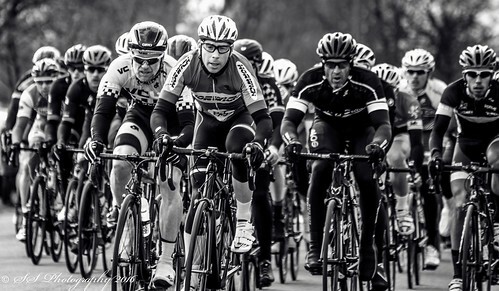 Ok, ‘cross season is officially over, the evenings are staying lighter (a bit), the classic one-day Euro road races have begun in earnest and the weather’s…well, the weather’s still in full on winter mode so we’ll ignore that. Spring is coming! After a few decent road races and having a suspicious amount of “fun” having a go at time trialling last year I’ve been keen to have another go this summer. I moved up from 4th to 3rd cat on the road (in one race, ahem) and started to wonder if I could move up again this time round to 2nd cat and of course, with time trialling, you always know where you could know a couple more seconds off your best time…so you have to do it again. You just have to. I figured the biggest issue with moving up to 2nd cat on the road would be getting into enough races to make it possible – the North West racing scene is burgeoning at the moment, which is great, but does mean that entering a race is no guarantee of actually getting a place. As such I waited until payday and chucked a good hundred or so quid at race entry fees, hopeful of getting as many rides as possible. Unsurprisingly, a mixture of Refusals, Reserved’s and a couple Acceptances started coming back. I guess it’s the same for everyone. Slightly annoying to not just get what you want every time but I’m not sure it’s worthy of the abuse some organisers have apparently been getting (bit of a soap box rant there). Suffering. Pic by Stephen Salmon. 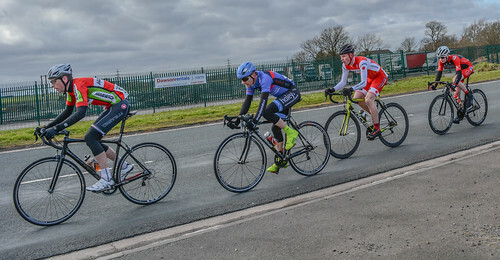 With lungs still a bit raw from the Tt effort, Sunday saw the first road race of the year in the glamorous venue of Pimbo. This race was one of the “Reserve” ones – where I’d not officially got a place, so had to turn up on the day and hope that someone who HAD got a ride didn’t turn up. Sometimes you find out in advance of the day if enough people tell the organisers that they won’t be coming but usually you just have to turn up, sign on and hang around until about 20mins before the start to find out if you’re taking part. It can be a bit stressy, to say the least, but on this occasion the hassle was worth it as I did get in, albeit with no time to warm up. The course was pretty simple, basically a lap of an industrial estate, with a slight (really slight!) climb to the finish line and a slight descent on the opposite side of the course. Although I much prefer hilly courses I was quite glad of the simplicity given the 90 strong 3/4 cat bunch I’d be riding with. Less technicality = less chance of mid bunch crashes. I knew straight away that the course wouldn’t suit me, but decided to make the most of the opportunity and have a bit of fun, rather than just wait for a last lap gallop for the line (which I’d have no chance in). Each time someone leapt off the front in an attack I’d try to go with them. If there were a couple of us I’d see if we could work together to get a break going, but nothing ever really looked like sticking. Bit of a shame, but it was nice to get back into the swing of things. Going with moves. Pic by Ellen Isherwood. By the last lap if was clear a bunch sprint was going to take place and the main group was getting to be a twitchy place to be. With half a lap to go I decided that there were too many bar touching, wheel overlapping nudges going on around me and worked my way off to the side, just in time as it happens as I’d just got into the wind out of the peloton as the hideous sound of carbon hitting carbon, followed by the squeal of locked up tyres and the high-speed-crunch of bikes and bodies hitting the ground echoed out just to my left. Having had to move back through the field a bit to work my way out of the bunch I knew I’d be too far back to get involved in the sprint (and, deep down, I knew I would be too slow to do anything other than become a rolling roadblock if I tried to muscle my up the the sharp end), which meant I rolled over the line in a fairly uninteresting 26th place. 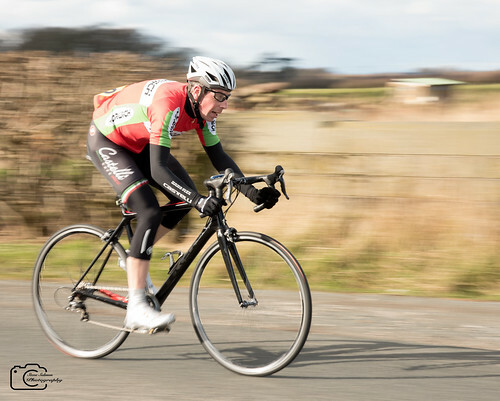 But I’d stayed upright, got a good workout up at the front and finished a fast race (27mph average, which was a bit quicker than I’d expected) without feeling tired, so there’s positives to take home.